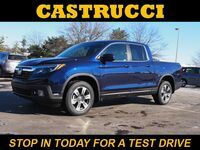 The Honda Ridgeline is back! Unique among midsize pickup trucks, the 2017 Ridgeline is designed for convenience and versatility. It offers all the utility and payload capacity of a traditional truck, without the ponderous handling and gas-guzzling drawbacks that tend to turn off first-time truck buyers. In addition to superior on-road handling, the 2017 Ridgeline is well-equipped for off-road duty, thanks to its available I-VMT4 torque-vectoring all-wheel drive technology with Intelligent Traction Management. It also offers one of the largest and most comfortable cabs in its class. The 2017 Ridgeline seats up to 5 passengers, and its rear seat splits and folds to create even more flexible storage options. State-of-the-art technology offerings include tri-zone automatic climate control, the Honda Sensing active safety suite, and an 8-inch audio touchscreen display featuring Apple CarPlay and Android Auto. At the top of the trim lineup, the Ridgeline Black Edition is the height of style, decked out in premium two-tone leather. All that, and we haven't even gotten into all the useful features packed into the 2017 Honda Ridgeline's bed. 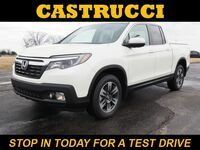 To begin with, it's wider and longer than the first-generation Ridgeline, with the only 4-foot wide flat bed space in its class. A lockable in-bed trunk is standard, featuring a fully flat floor and a drain plug for easy cleaning. The Ridgeline's unique dual-action tailgate remains one of its most useful features: the tailgate can swing open horizontally as well as downward, making it easier than ever to load and unload large, heavy cargo. The 2017 Honda Ridgeline is now available with a 400-watt power inverter built directly into the truck bed, perfect for plugging in whatever tools you need for the job. The new Ridgeline also features the world's first in-bed audio system, with a 540-watt exciter system built into the truck bed. Whether you'll use it for outdoor parties and events, or just for cranking up some tunes while you work, one thing is clear – you can't get this kind of innovation on any other truck. The 2017 Ridgeline thinks outside the box. We invite you to do the same. 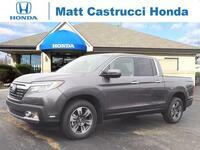 Interested in learning more about the 2017 Honda Ridgeline in Dayton, OH? Contact us to take one for a test drive!